When we have meals at my better half’s family’s house, there is usually a round of “what are you thankful for” and a short prayer before we dig in. While I don’t identify myself with any particular religion, I enjoy hearing what others are thankful for, and I have quite a long list I try and reflect on often. I believe it’s good to reflect on the things that make you feel lucky, blessed or special because if you concentrate on the good things in life you will continue to work toward them. Late in summer, New World Library contacted me, asking me to review their book, Bless This Food by Adrian Butash. At first I was a bit hesitant because I tend to stray away from reviewing books with religious undertones, but this one really intrigued me. When I think about the purpose of prayers, a lot of them revolve around food and how it comes to my plate. I find it a small miracle to find delicious and nutritious food on my plate multiple times a day. I strive to eat wholesome, amazing food, and I count my blessings that we have the financial stability and time to devote to it! This book takes that idea a little bit further, and shares prayers that have been said or sung throughout history of the world. The common theme in Bless This Food is the appreciation toward the food on one’s plate. Bless This Food is softcover and a nice handheld size–easy to tote to your next Thanksgiving gathering! The book features over 150 prayers from different cultures and religions all over the world. Prayers refer to Jesus, God, Allah, Zeus, and more. I liked reading everything from the old Chinese proverbs to the Pawnee Indian Prayers. For rest and shelter of the night. For everything Thy goodness lends. Adrian Butash is a well-known creative and marketing professional and a producer of significant fine arts, television, and film projects. Butash has produced award-winning advertising campaigns and corporate marketing successes for Fortune 500 clients. He is an acknowledged color expert in beauty products and fashion. A graduate of Fordham University, he studied philosophy and cultures of the world. He is also an Independent Holocaust scholar who has designed a memorial for the Mauthausen concentration camp. He and his family live in Santa Barbara, California. 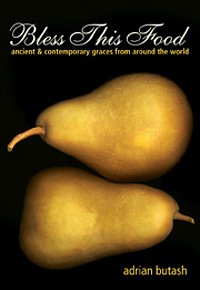 *Excerpted from the book Bless this Food: Ancient & Contemporary Graces from Around the World © 2013 Adrian Butash. Printed with permission of New World Library, Novato, CA.www.newworldlibrary.com. This book will feed you and those around you interested in the topic. How do you express your thankfulness for what’s on your plate?